DiaMedical USA supplies certified refurbished hospital beds to all facilities. The beds undergo an extensive refurbishing process that can be reviewed here. Each and every refurbished hospital bed comes standard with a foam mattress, mattress cover, Tente casters, and a new headboard & footboard. DiaMedical USA provides refurbished Hill-Rom hospital beds, Stryker hospital beds, Burke Bariatric hospital beds, Gendron hospital beds, Medline, Span America Low Beds, and more! Our selection of new and refurbished hospital beds include several well-known hospital bed manufacturers. Prices like ours are unavailable anywhere else. With discounted OEM pricing on all hospital beds and parts, DiaMedical USA will save your healthcare facility time and money. Browse discounted Amico beds, discounted Burke Bariatric beds, discounted Gendron beds, discounted Graham-Field beds, discounted Hill-Rom beds, discounted Invacare beds, discounted Medline beds, discounted Span America low beds, discounted Stryker beds and discounted Transfer Master beds. Whether you are in need of a brand new hospital bed or a refurbished hospital bed, we have the best hospital beds to match what you are looking for. 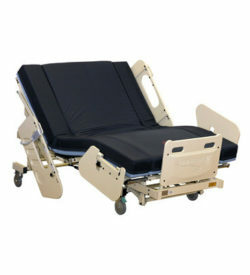 Choose from inexpensive Amico hospital beds featuring various functions and headwalls, affordable Burke Bariatric hospital beds, economical Gendron hospital beds, various Graham-Field hospital beds and Graham-Field homecare beds, best-selling Hill-Rom hospital beds, low-cost Invacare hospital beds and Invacare hi-low hospital beds, numerous Medline hospital beds and parts, electric Span America low hospital beds, cost effective Stryker hospital beds and comfortable Transfer Master hospital beds.